Survival is not about how long you can stay lost, it’s about how soon you can be rescued. With water submersion, time is urgent! To be rescued, you must be found—NOW! While we’ve all heard the “after rescue” stories, there’s one comment that I find most prevalent: “They flew right over me several times. How could they NOT have seen me?” The survivors seem so fixated on this statement. As a side-window Scanner for U.S. Coast Guard C-130, HU-25, and HU-16 aircraft, I made it a point to search for every person in water (PIW) as if I were searching for myself. After all, if I was the one out there, I’d want the persons searching for me to do the very best they can. To become a qualified HC-130 Scanner, one must complete a syllabus for pre-flights, post-flights, fueling, servicing the aircraft, and, of course, standardized search procedures. When searching for a PIW, Scanners are trained to scan parallel to the trailing edge of the wing, out to the wing tip, and then back in. Flying at around two hundred feet off of the surface, this method will give approximately a one mile visual from the aircraft. This procedure is used in conjunction with the tracking pattern entered into the aircraft’s NAV system. The wing-tip rule ensures a one mile search range for the Scanner while the aircraft is set at two-mile tracking. This means that the Scanner searches one mile out from the aircraft and then, when the aircraft turns to do the reverse tracking, the scanner on the other side of the aircraft scans the second mile. In essence, the two-mile tracking is divided and searched twice (left and right scanner positions). Scanners are also trained to scan by keeping their eyes moving. The Scanner is taught that the probability of spotting a PIW by direct sight is less likely than spotting them with peripheral vision. In other words, we all know that it’s nearly impossible for a person in an aircraft moving at around 150 knots to spot a PIW with no signals—repeated survivor and non-survivor stories tell us that. A live PIW will be positioned head up and feet down (unless in an immersion suit). Thus, the only thing visible from the air is the PIW’s head. By keeping the scanner’s eyes moving in an up and down motion (fuselage to wing-tip), the PIW will most likely be spotted by the unusual occurrence – a change from seeing just gray water with occasional white caps – via peripheral vision. This scanning method also helps to relax the brain and lessens fatigue. If you simply stared at the water, you’d become fatigued within minutes. 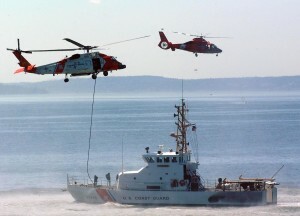 Usually, when a Coast Guard HC-130 does a known search, they will place an extra Scanner on board to help rotate positions. With three Scanners, you can do a rotation every hour with a break between shifts. My longest search took place off Sitka, Alaska, where we searched for a downed aircraft for thirty hours over a three-day period. For ten hours each day, we searched the water and along the adjacent shoreline and mountains for any signs, but, sadly, yielded no results. As a PIW, you have to make an unusual occurrence happen in order to be spotted. If, for example, a Scanner’s peripheral vision passes over an orange object (or any color other than the usual gray), it sounds an alarm in the scanner’s brain that something is different. If the Scanner looks back and it’s gone, it’s now up to the Scanner to make his report: “Pilot-Aft, I think I just spotted something at three o’clock. It looked orange and I only saw it for a second or so.” The navigator will then lock on to the position where the report was made and turn to intercept that position to conduct a low-level search. Now, let’s complicate that scenario by searching for PIWs in Alaska or other areas where they use orange-colored crab pots. Most have seen the TV series, Deadliest Catch. Ever notice the color of the buoys that they throw overboard? Yep, international orange! Think about conducting a PIW search in that area. After seeing hundreds of small orange buoys floating in gray water, searching becomes an even greater challenge. To be spotted you must change normalcy to attract the Scanners’ peripheral vision—on the first pass. For instance, if I were an Alaskan fisherman, I’d consider changing my signaling colors to, perhaps, a florescent green, or, at least, don a bright green hat or signaling cloth. Remember, the Scanner will spot a change of scenery and color before he spots you. Waving your arms above your head (while in the water) does about as much good as yelling at the aircraft. The rules to survival change when you’re submersed in water. As a PIW, your main objective is to be rescued—quickly! You are completely surrounded by a dangerous and potentially fatal environment that you have absolutely no control over. Your body is losing heat at a very fast rate and your only chance is to get yourself out of the heat-robbing water. Any water temperature below 70 degrees can kill you. There are two types of signals—active and passive. An active signal is one in which you must physically produce the signal, waving two hands above your head or aiming a signal mirror, for example. Conversely, a passive signal is one that can be placed and left unattended, like building a fire or stringing a bunch of brightly-colored crab pots from a tree. On the water, one of the most effective signals is a signal mirror. Simply place the mirror in your pocket prior to an over-water flight and, if needed, it’ll be there ready for you to use. The center of the signal mirror has a see-through hole. By placing the signal mirror (backside) up to your eye, you should see a bright spot. This is the nucleus of the sun. By aiming this bright spot at an aircraft or boat, you are aiming the signal. Another way to aim the signal mirror is to make a V with your first two fingers (gun sight) and, with the other hand, aim the mirror flash at the bottom of the V. You can actually place the flash in the window of a searching aircraft or boat using this method. Signal mirrors can also be used in overcast daylight and at night using moonlight. Signal mirrors have been spotted from the air at distances as far as 60 miles away. If scanning the horizon with a signal mirror, you will reach approximately fifteen miles because of the curvature of the earth. By scanning the mirror at about thirty degrees above the horizon, you can be spotted by high-flying aircraft. The signal mirror emits a reflection from the sun and produces a very effective eight-million-candlepower flash. A signal mirror is categorized as an active signal, but it can easily become passive by attaching the mirror to the outside of a life raft or dangling it over your shoulder while floating in the water. In the water without a signal mirror? Here’s a little secret that will place thousands of sun reflections at your disposal. Cup your hands and throw as much water into the air as you can. Each droplet of water will create a reflection from the sun’s prisms. This is a very effective signal to use when aircraft are seen in your search area. We’ve covered the difference between an active and a passive signal, so now let’s discuss the long range signal vs. the short range signal. Simply put, a long range signal will notify searchers that you are in trouble, while a short range signal will direct the searchers to you. Even though a signal mirror can be considered a long range signal, it doesn’t necessarily inform others that you’re in distress. Remember, boats have glass or Plexiglas windows that also reflect flashes. If Scanners were diverted every time they saw a flash on the water, most searches would prove rather unproductive. However, if it was known that someone in the area was in distress, such a flash would be investigated. How do you communicate distress? The most common way is to use an Electronic Location Transmitter (ELT). There are different variations of ELTs, such as the Personal Location Beacon (PLB), the Emergency Position Indicating Radio Beacon (EPIRB), and the ELT carried on all aircraft. The electronic signal is transmitted to a satellite receiving station and then forwarded to a search and rescue command center. Once the command center gets the information, they will attempt to give you a call to verify the distress. When purchasing an ELT, you are now required to register the unit with the National Oceanic and Atmospheric Administration (NOAA). This registration gives the command center valuable information about you—who you are, where you live, your phone number, your aircraft type, color, etc. I also recommend that you indicate what type of survival equipment you carry on your aircraft in the “remarks” section. For instance, if you indicate that you have life vests and a life raft on board, this raises your probability of detection (POD) and probability of survival (POS) score. This will not only give the search coordinators a better idea of your drift rate (wind and current factors), but such information could potentially extend the amount of time that they search for you. An EPIRB is fairly large and is used mostly on small boats with either a manual deployment or a hydrostatic deployment. I’ve heard of some pilots who like to carry an EPIRB in a ditch bag, but I don’t feel it necessary to carry such a large unit, especially when the much smaller PLB serves the same purpose and function. A PLB is small and can be easily attached to your belt or to a life vest. I prefer the PLB over any of these devices because it is carried on you, not your vessel. In the case of an aircraft ELT, it will work just fine—as long as the aircraft doesn’t sink. (Hello, it’s an AIRcraft. They’re not designed to float!) If you’re depending on the aircraft’s ELT to bring searchers to you in the water, know that it will not complete the signal to the satellite once the antenna becomes submersed. Besides, you want them to search for you—not your aircraft. New PLBs are digitized and seem to get smaller and smaller each year. But, don’t let the small size fool you; they still put out the same frequencies (alternating 406MHz and 121.5MHz) and have the same wattage that the larger EPIRBs emit. The only difference is that the EPIRB battery is larger, thus giving the EPIRB a longer transmit time. A PLB transmit time is normally 24+ hours. This is, typically, plenty of time to locate you just about anywhere on the globe. In fact, the new 406MHz frequency can be picked up by Coast Guard aircraft as far as 150 miles out! The McMurdo FastFind Max-G PLB now transmits up to 48 hours. All ELTs will alternate between 406MHz and 121.5MHz. This provides two different frequencies for redundancy and accuracy. The satellites will no longer receive the 121.5 frequency from the ELT, but it does give a fairly accurate position direction for surface vessels within line-of-sight, thus providing long range and short range function. In summary, as a PIW your priority is to get out of the water as soon as possible. You must have effective signals and you need to have these signals ready to use within a split second. Once you spot an aircraft flying towards you, you will not have time to start fumbling around in your gear bag to find a signal. Once the aircraft flies over you, it may not come back. Your signals must be ready and they must send a message—your life depends on it! As a general rule, distress signals come in groups of three: three fires, three logs laid parallel on the beach, three gun shots, and the well-known “Mayday, Mayday, Mayday” call. Remember, a single fire may indicate that you’re camping, whereas three fires in a row indicate distress. Waving one hand above your head says “hello,” whereas crossing both hands above your head indicates distress.